We’re just going to come out and say it: Code Vein is basically Dark Souls. Expect to see that plastered on the “It’s Like Dark Souls” Twitter account within the next couple of days, but it’s true. The Souls games have practically become a genre unto themselves, with games like Sci-Fi Souls (The Surge), Samurai Souls (Nioh) and now Vampire Souls. 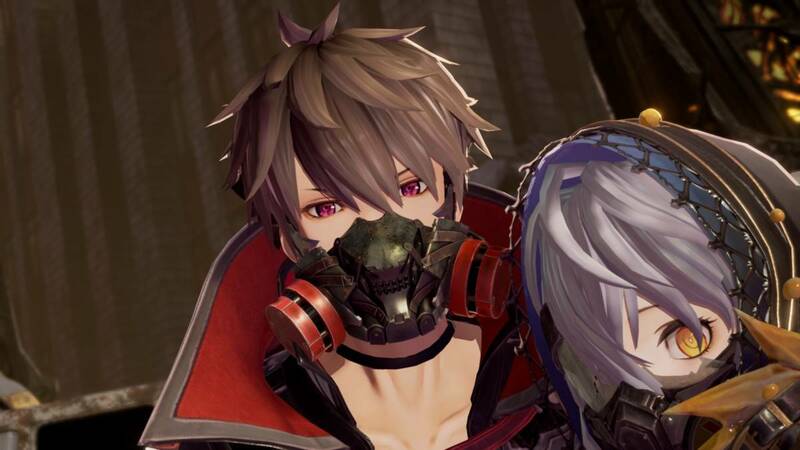 Fortunately, Code Vein does enough to distinguish itself from its fellow Bandai Namco property. Set in a ruined post-apocalyptic world filled with demons and vampires, it’s up to you to kill said demons, get loot, level up and kill stronger demons. That’s the plan anyway, as like any self-respecting Souls style game, Code Vein does absolutely everything in its power to kill, murder, mutilate, destroy and obliterate you, and it will often succeed in that goal if you’re not careful. The core gameplay involves the usual light and heavy attacks, along with dodging, blocking and parrying for your defensive capabilities. Blocking is basically useless as you still take damage, and parrying can be tough to pull off in a fight, especially when you’re first starting out. With practice, it’d become second nature, but as with other Souls games, the best strategy is just dodge rolling to victory. The Fred Durst method, if you will. Despite that, Code Vein favours an aggressive play style, especially against weaker enemies. You can usually dispatch of most enemies with a solid combo before they can launch an attack, and the game will give you access to special attacks once you’ve filled a meter by dodging attacks or just taking damage. These special attacks will one shot fodder enemies and do significant damage to mini bosses, though bosses will just laugh at you. You’re lucky if they get even slightly stunned. Code Vein continues to differ from traditional Souls games as you can switch to different classes on the fly. The three that were available in the demo were fighter, assassin and mage. They’re fairly self-explanatory, with fighter being the solid all-rounder, assassin having low health but more stamina, and the mage able to dominate from long range. Each class affects your stats in a number of ways, but also your Gifts. Gifts are another idea unique to Code Vein that allow you to utilise Ichor to either give yourself attack buffs or unleash devastating magic on your opponents. You can have up to eight equipped and that can be a real game changer in battle, but each Gift costs a set amount of Ichor. Though Ichor comes back slowly, you can use Drain attacks, activated by holding the X button, to replenish Ichor, but they take a while to charge up, even if they are capable of one shotting low tier demons. They’re best used when dealing with weak rushing demons, or when a boss is vulnerable, but using them while surrounded is a fool’s errand. Code Vein also gives you an AI controlled partner to help you out in your adventure. They’re loyal to a fault, offering healing if you go down at the cost of their own healing items, making it a finite resource, and they’re competent enough to hold up their end of the bargain during a fight. Their inclusion is a welcome one, as they can pull aggro while you cower in the corner as you heal up. Often, they’re more effective at demon slaying than you are. Or, at least, more competent than I was. Souls style games have never been my strong suit. While the partner can make things easier, you can still get annihilated quickly, especially if you allow yourself to become surrounded by monsters. There’s one moment during the middle portion of the gameplay demo that proved a sticking point during my first playthrough, but my second and third attempts proved to be much better. It’s this essence that makes Souls games so addictive for a lot of players, and it’s present in Code Vein. Each subsequent demo playthrough led to more progress being made, more understanding of the mechanics at play and ultimately more fun being had. Even the boss at the end, a giant wet lady with a big stick that’s something something something Freudian, proved to be a real problem during the first couple of attempts, but each attempt edged me closer to killing the thing. Rather frustratingly, I never did, as the demo would always time out before I could dole out the final few hits. Though it’s likely that Code Vein will do little to convince you about the quality of Souls games, it does introduce plenty of new mechanics and ideas that should help the game distinguish itself from what is becoming a crowded genre. Either way, you won’t have to wait long to find out, as Code Vein is out on September 27th for PS4, Xbox One and PC. Make sure to check out our woeful attempt at gameplay footage below, and if you want to learn more about Code Vein, have a read of these quick facts.